For marketers who wish to reach the lucrative youth market, the relatively uncluttered medium of the school environment represents the final frontier -- access to a captive audience of millions of students. Meanwhile dwindling federal, state, and local funding for education has left many schools vulnerable to the advertiser's pitch. As a result, commercialism has steadily increased in America's public schools in recent years, often with little or no public awareness. Captive Audience examines this growing phenomenon through numerous examples of in-school advertising; interviews with teachers, students, parents, and activists; and a case study of community action to oppose an exclusive soda contract in the Pittsburgh school district. Media scholars and critics -- including Alex Molnar, Professor of Education Policy, Arizona State University; Henry Giroux, Professor in Secondary Education, Pennsylvania State University; No Logo author Naomi Klein; and Bill Hoynes, Professor and Chair of Sociology, Vassar College -- offer a broad look at the issues at stake. 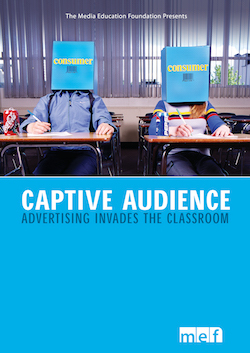 Captive Audience is a compelling expose of the transformation of classrooms, hallways, cafeterias, and textbooks into advertising vehicles. It explores how education is short-changed and democracy is at risk when schools become marketplaces and commercialism goes to the head of the class. "Captive Audience does much more than map the various forms that school commercialism takes. It makes a powerful case that the real danger posed by commercialism is that students are principally being made into consumers rather than citizens capable of understanding and participating in democracy. . . an utterly essential resource for those concerned about the future of schooling." "If you think that our schools should teach kids how to be active citizens rather than passive consumers, here's a video that'll give ammunition for agitation." "Our public schools are being hijacked by transnational corporations who care more about branding and the bottom line than civics, critical thinking, and citizenship. Captive Audience turns a bright spotlight on this phenomenon, and shows us how we can fight back."